MARGAO: The laterite stones on the Colva church walls appear to be eroding and need urgent attention. 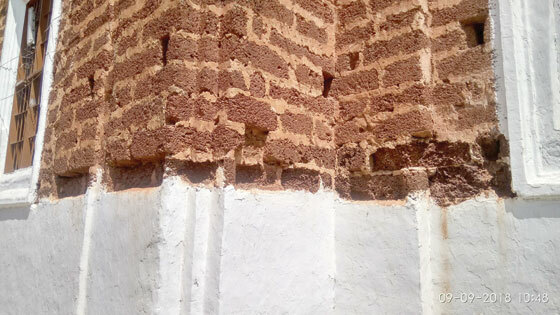 Villagers pointed out that the southern and eastern walls of the Church appear to have eroded with some parts of laterite stones falling off. Shakuntala Misquita, a local said the church was built in the 18th century and needs to be protected as a heritage structure. “The Archaeology Department should check the structure and if need be the same must be plastered with lime to protect the stones from eroding further”, she said. “There are too many vehicles on the road these days”, claimed senior citizen John Fernandes hinting at pollution and vibration as the cause of the eroding of the walls. He said that Colva church authorities in recent times have failed to take the maintenance issue seriously.